Barcelona have sold striker Bojan Krkic go AS Roma in a deal worth 12 million euros. The deal includes a buy-back clause that allows Barca will buy Krkic back for 13 million euros at the end of the 2012-13 season. To block this purchase, Roma will have to pay an extra 28 million euros. The forward will link up with former Barcelona B coach Luis Enrique, who was appointed by Roma earlier in the summer to spearhead the club’s new project under American owner Thomas DiBenedetto. Bojan was a popular figure at Camp Nou but has chosen to leave the club in search of regular football, having started only nine games in La Liga this season. 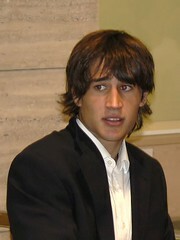 Bojan scored over 900 goals during his time at La Masia and broke into the first team in some style when becoming Barca’s youngest ever goalscorer in October 2007. After scoring 10 goals in his debut season in La Liga he turned down the chance to represent Spain at Euro 2008 due to his young age, but over the next three seasons failed to get into double figures for Barca as he struggled for appearances under Guardiola. Sounds like a great deal for Barca. Krkic gets regular first-team action for the next two years and Barcelona get an option to buy him back for only one million more euros then they received for him.